The online visualization tool charts 90 different environmental factors that impact American diet and health. At last week’s TED conference, Jamie Oliver, the passionate British chef who won this year’s $100,000 TED prize, became emotional as he showed pictures of the residents of Huntington, West Virginia, America’s fattest city–who will, on average, live shorter lives than their parents due to diet-related illness. Oliver has been in Huntington to shoot a new ABC series, Jamie Oliver’s Food Revolution, about his sometimes quixotic efforts there to educate the community about healthy eating. A few days before Oliver’s talk, Michelle Obama announced the launch of a new Web tool, the Food Environment Atlas, which shows both how daunting Oliver’s food revolution will be and how much social factors have to do with American eating patterns and the obesity epidemic. 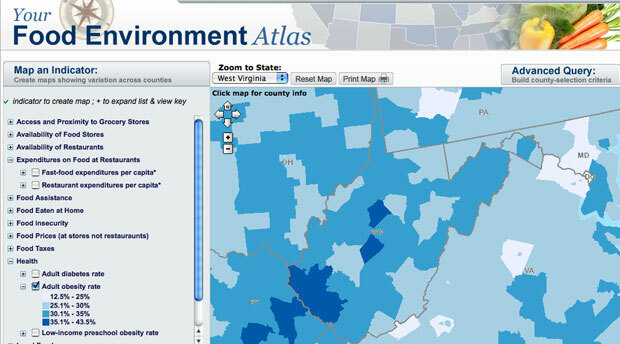 Developed by the USDA’s Economic Research Service, the atlas is an interactive map that allows users to create custom county-by-county maps based on 90 different “food environment factors” based on data culled from a wide array of sources–including the Centers for Disease Control and Prevention, the National Cancer Institute, the University of Illinois, and more. This lets the user draw connections between demographics and food consumption–the relationship between median household income and rates of preschool obesity, for example, or between pounds of food eaten at home and rates of physical activity. The Atlas offers a kind of spatial analysis that is interesting to anyone because of the insights it reveals about how Americans live (not very well, to put it mildly! ), but it will have particular value to journalists, demographers, academic researchers, policy makers, and anyone studying the connections environment and public health. And whatever impact it has on the War on Obesity, the Atlas is yet another sign of the Obama administration’s commitment to making large data sets accessible and intelligible to the general public; however history winds up judging this President, the democratization of data that’s taking place under his watch is quietly becoming one of his most significant legacies.